While most folks didn’t have a problem updating to the current version of Windows 10 (Windows 10 Fall Creators Update – Version 1709, as of this writing) some folks did have problems. And after a couple of failed attempts, they find that Microsoft repeatedly tries to install the failed up update. This is not only annoying, but it takes a lot of time. We have advised people who had trouble updating to Windows 10 version 1709 (Fall Creators Update) – even those who tried updated by using the Update assistant or installation media – to wait until the next update coming sometime this spring. The purpose of a Metered connnection according to Microsoft is for those who have bandwidth limits or limit the amount of data you can use. However, you may also want to use Metered connection to prevent Windows from downloading large updates or to prevent version updates that have already failed to install from continually trying to reinstall. On the Creators Update and newer (including Fall Creators Update), Microsoft has changed Metered connection so Windows Update is allowed to download critical security updates automatically. Microsoft has said they will not abuse this. 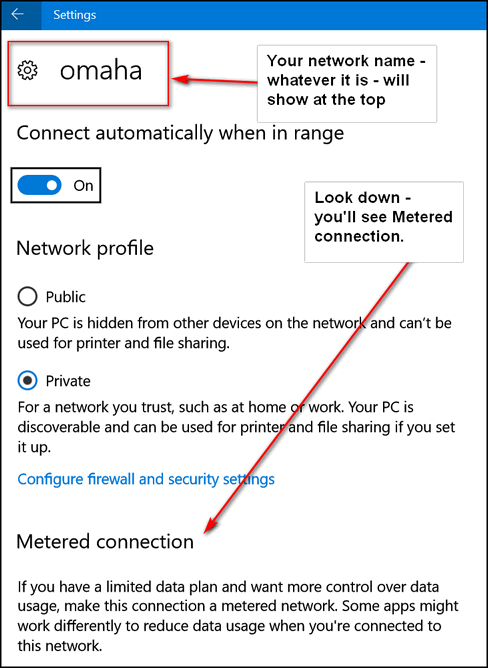 So, turning on Metered connection should allow you to receive all critical security updates that help keep your Windows 10 PC up-to-date and safe. 1. You will only receive critical security updates automatically. You will not receive Windows version updates (like Fall Creators Update). Or cumulative updates. You can install Cumulative updates by downloading them from the Windows Update History page. 2. Windows stores apps and apps included with Windows 10 will no longer update automatically. However desktop programs you installed, such as Firefox, Chrome, and others will continue to update as they always have. 3. Microsoft says that live tiles on your Start menu and/or Start screen “may” stop updating on a metered connection. 4. “Some” Windows Store apps “may” function differently or with limited functionaity. 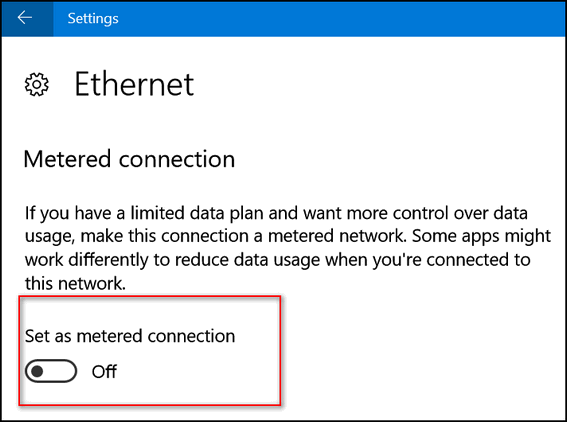 If you’re having problems with Windows Update trying to continually install a new version update or you’re on a connection where you have data limits, here’s how to turn on Metered connection. Open Settings (Windows key + i) or open Settings from the start menu or the Windows key + x menu. In Settings, click on Network & Internet. On the Status page, under your “Network status”, click on “Change connection properties”. 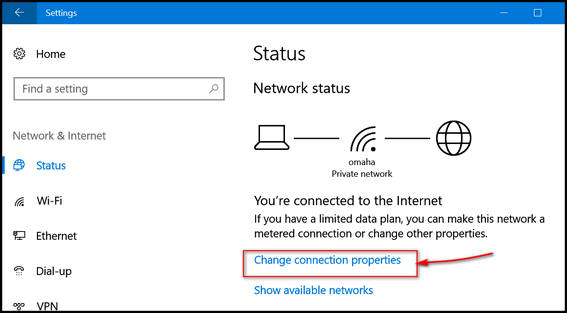 If you don’t see “Change connection properties” click on “Wi-Fi” on the left side, then click on your active connection. See screenshot below. Under “Metered connection” you will an on/off switch under “Set as metered connection”. Turn the switch under “Set as metered connection” to “On”. 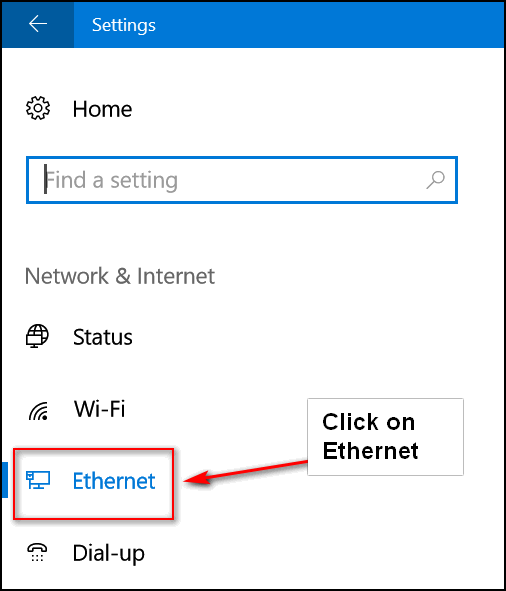 If you’re using an Ethernet connection, open “Settings”. In “Settings” click on “Network & Internet”, then click on Ethernet on the left side. Added: Reader David B. pointed out to us, that after you click Ethernet you’ll need to click on your connection. Under “Metered connections” “Set as metered connection” turn the switch to “On”. 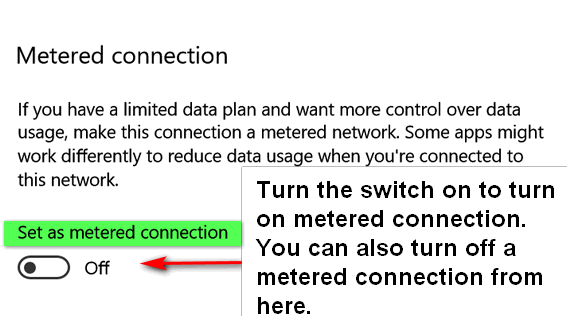 Whether you’re on a Wi-Fi connection or Ethernet, should you ever want to go back to a non-metered connection, follow the steps above only this time turn the switch to “Off”. Thank you so much for an answer to this aggravating problem that I have been living with for at least a month or more. Such a simple solution. You have made my day today! So glad you are here. Thanks,your Thunderbird installation was great. I have been battling this for 6 wks and the version 1709 has failed 4 times and how special to see a solution to a problem and thankfully going back to previous version. Even with metered ticked on you will still get Major Updates! I received two cumulative updates and one featured update within the last two days on my metered connection. One was Windows 10, version 1709. Metered is a misnomer it should read joke of the day! Not according to Microsoft. You need to write them and complain. Also, last spring, I had a program on one of my computers that was not compatible with version 1703 (Creators Update), I used metered connection to stop that version from downloading and installing automatically. When the program I needed issued a compatible version, I installed version 1703 update Version updates are sometimes very large, so if they are downloading over a metered connection something is wrong – it could be very expensive and inconvenient if you were actually getting charged over a data cap. Check it out with Microsoft. And, bless you, you will let us know when it is safe to run this in reverse?